'Mendip Cottage' In Beautiful Somerset and close to the Beach -* Free Spa Day*. Sleeps 2. 1 bedroom cottage. Mendip has an open plan living room with exposed beams and a vaulted ceiling, and modern wall mounted real flame coal effect fire. There is solid oak furniture in lounge and bedroom , tiled floors and wonderful underfloor heating throughout. Free WiFi internet. A good sized double bedroom which has a lovely contemporary en-suite fully tiled wet room, toiletries and 100% Egyptian cotton towels. A rear door opens onto an extremely private and sheltered patio at the rear. South facing, so a real sun trap . Ground floor open plan living room with kitchen and dining areas. TV and DVD player, WiFi and modern coal effect electric fire. Electric hob, electric oven, microwave and fridge. Bedroom 1 with double bed, TV and en-suite wet room with shower WC and washbasin.Stunning Views of the Somerset Mendip Hills and beautiful Somerset Countryside but only 3.5 miles from Weston super Mare. Wet room, consisting of walk in shower, wash basin and toilet, tiled floor with underfloor heating. Underfloor heating throughout property. Modern wall hung electric fire in lounge. Plenty of Parking available outside front door. Bath towel and hand towel provided per person 100% Egyptian cotton. Dining table and two chairs provided in cottage. 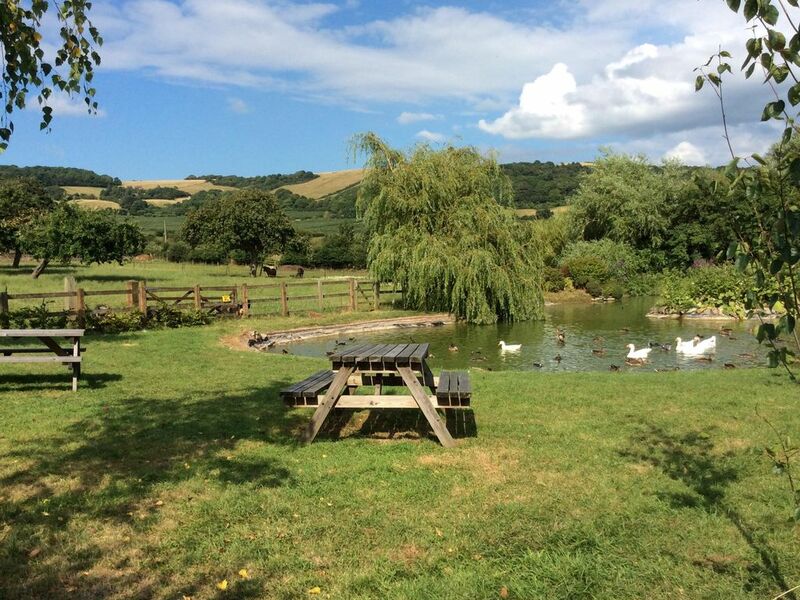 Outdoor seating available by large duck pond overlooking beautiful surrounding countryside views. Notes on accommodation: One free entry per adult per stay included to use the facilities at local Webbington Spa which has a Swimming Pool, Sauna, Steam Room and full Gymnasium. Private parking to both properties Free WiFi internet Cream tea on arrival Sorry no children under 16yrs Sorry no pets Change over day, Friday Outside: South Hill and Mendip have private patio areas with their own access. There is also available a lovely grassy area with picnic tables by a large duck pond with views across the beautiful surrounding Mendip hills and famous Thatcher cider orchards and paddocks where our miniature Shetland ponies, Hampshire down sheep are kept. A perfect place to unwind and enjoy this peaceful rural setting. We had a fabulous stay at Mendip cottage. It was a lovely cottage, very well equipped. We would recommend Mendip cottage to anyone. It had everything you could possibly want. Lovely cottage in beautiful surroundings. Absolutely spotless. Will definitely go back. From the warm welcome with a cream tea and chocolates to the spa day at a local hotel, nothing was too much trouble for Trudy and Paul. The property is beautifully finished with everything you could possibly need for a short weekend break or even longer. It is in a good location to explore the Mendips and further afield if so desired or just to sit in the small courtyard garden and enjoy the sunshine. Good welcome from owners, cottage was well maintained and provisioned. Area was interesting and there was plenty of local information given. Lovely, quiet and relaxing stay. Had a wonderful few days during the Christmas holidays at Mendip! We were greeted by Trudy and had a cream tea and a bottle of fizz waiting for us which was very thoughtful. The accommodation was perfect for us, very quiet and relaxing and was situated in an ideal spot to explore Somerset. We will hopefully return this year and would highly recommend this property. Lovely cosy cottage in beautiful surroundings. Cream tea was a lovely extra on a cold afternoon. All very comfortable and homely. Would highly recommend this as a place to stay. The cottage is lovely, and very well equipped- we had everything we needed for a great holiday. We were greeted by Trudy, Archie the dog and a lovely cream tea which was very welcome after a long car journey. Very handy for visiting the area, both the coast and the countryside, and we had a lovely lazy day "at home" sitting by the pond and putting the world to rights, and it's a great place to do just that. We can highly recommend for a relaxing break. Will definitely stay here again if we are in the area. Frank, the other dog, is a real character and really friendly.